Earlier this year we launched our official website in order to facilitate business with clients. Developing our strength as a firm has always been a goal to pursue in the course of carrying out client projects. Our core services- talent management, media marketing and brand consulting are readily available. However, our full range of services now include advert designs and music distribution services. Social Media Solutions (S.M.S) are inline with media marketing, our core service at Telepse. 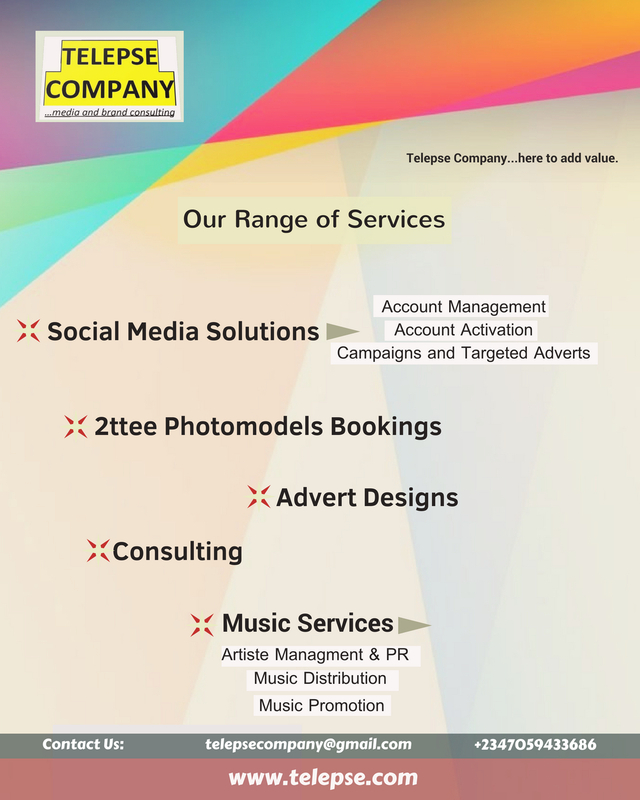 We also highlight our client services to ‘2ttee Photomodels’ as a booking agent. At Telepse, all your advert needs can be fulfilled with advert model bookings and advert design services. We can also link up clients with agencies for advert distribution. Telepse currently consults for a students’ club brand- University of Lagos Students Assembly (U.S.A) for project ideas and proposals. Our artiste support services include music distribution and social media promotion. Please use our contact form for any enquiries on how we may be of assistance to you.